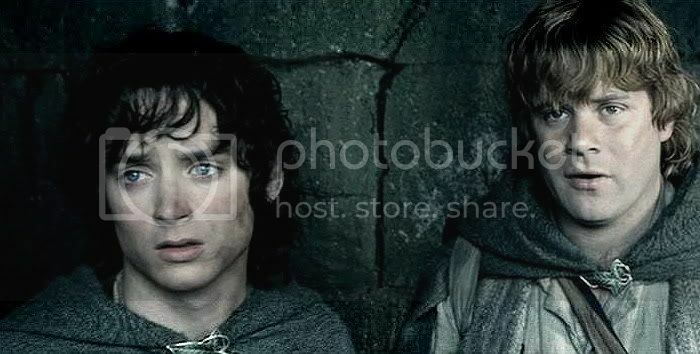 This entry presents screencaps of Frodo on the walls of before the Nazgûl, and bidding farewell to Faramir at the entrance to the sewers of Osgiliath. 1. Frodo on the walls of Osgiliath. This scene has been discussed here and everywhere in the LotR fandom. I’ll only say that a brilliant poster in the Movies Forum at TORc (Tolkien Online), Magpie, first helped me get past my sense of affront to see the cinematic genius of the scene, breathtaking in its painterly, apocalyptic visuals, and beautifully scored by Howard Shore. I have always wanted to see the visual sequence, frame by frame, as Frodo stands there, Sam dashing out to prevent him from putting on the Ring. As a screencapper, I finally could do that. And here they are: two tiny figures set against a huge canvas, Frodo's little cloak floating up, caught in the currents as the great tattered wings of the beast stroke up and down, white and silver clouds boiling up over the ruined city and the dark jagged Ephel Dúath behind it. I only wish the images were larger. 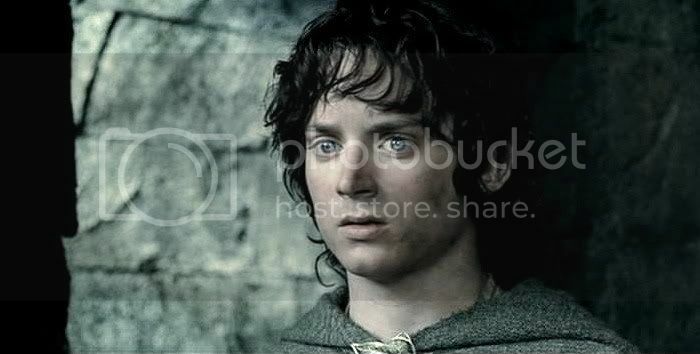 Magpie had said something about how this scene portrayed in a striking image the sheer magnitude and power of what Frodo was up against: portrayed it visually in a way no dialogue scene could achieve. I loved what she wrote, in any case. I always appreciate it when fans help me find new ways to love the films. As usual, the screencaps for both these scenes, made from the EE of TTT, have been cropped and adjusted for brightness, contrast and focus. 2. Frodo bids Faramir farewell at the sewers of Osgiliath. This scene is, I think, one of the best scenes added to the EE version of The Two Towers. I still don’t like Faramir’s violent handling of Gollum, or the fact that Frodo stands by while Faramir does it, but I think Faramir's treatment of Gollum is more explicable in this scene, since Faramir has just found out where it is that Gollum is leading them. Gollum’s acting during and after this exchange absolutely wows me. And he’s a CGI character! His performance reduces me to tears when he tells Sam, “No, no. No hard feelings,” suppressed pain, rage and hurt nearly choking him as he trails along behind the hobbits at a limping crawl. 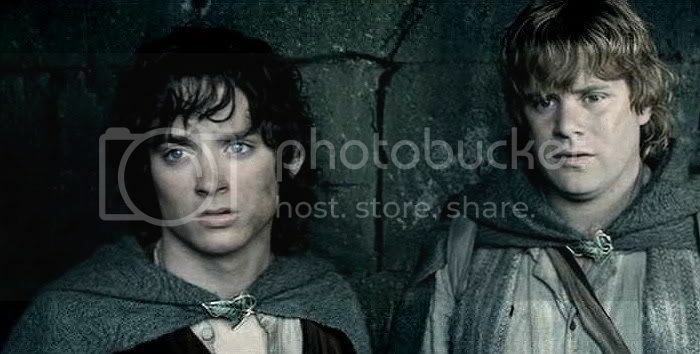 I might add that Frodo in this scene is ravishing almost beyond description. In the first caps, especially, he has the dark, dreamy glamour of a film star of the Great Age of film, like Hedy Lamar or a Greta Garbo: beautiful in a lush, soulful way. How Faramir could let him go, I don’t know. ;) In the close-ups that follow, his fatigue shows clearly; yet his face, pinched with care and worry, is more beautiful than ever. Film Scene (from the EE): The Sewers of Osgiliath. Faramir: This is the old sewer. It runs right under the river through to the edge of the city. You'll find cover in the woods there. Sam: Captain Faramir, you have shown your quality, sir, to the very highest. Faramir: The Shire must truly be a great realm, Master Gamgee, where gardeners are held in high honour. What road will you take once you reach the woods? Frodo: Gollum says there's a path near Minas Morgul that climbs up into the mountains. Faramir: (to Sméagol, taking him by the throat): Cirith Ungol? Is that its name? Faramir: (to Frodo): Frodo, they say a dark terror dwells in the passes above Minas Morgul. You cannot go that way. Gollum: (to Faramir) It is the only way. Master says we must go to Mordor so we must try. Frodo: (to Faramir) I must. Faramir: Go, Frodo. Go with the goodwill of all Men. Frodo and Sam turn away into the sewer; Faramir again takes Gollum by the throat. Faramir: (softly) May death find you quickly if you bring them to harm. Gollum crawls after Frodo and Sam, favouring his right hand. Sam: (to Gollum) Come on, keep up! (Sees that Gollum appears to be in pain.) Mr. Frodo didn't mean for them Rangers to hurt you. You know that, don't you? He was trying to save you, see? Sam: So there's no hard feelings. Forgive and forget. Gollum: No, no, no hard feelings. Gollum, gollum. Yes, master. Nice Hobbits. Sam: That's very decent of you. Very decent indeed, Gollum. The Sewer scene is an invention of the screenwriters, but some of its lines—and lines used in other parts of the Henneth Annun scene—come from the book scene below. In it, Faramir has already brought the hobbits up to the hideout behind the falls, allowing them to rest before they are invited to join him at the evening meal. After their time of privation, it seems a feast to Sam and Frodo, made even better by wine, convivial talk, and shared lore. 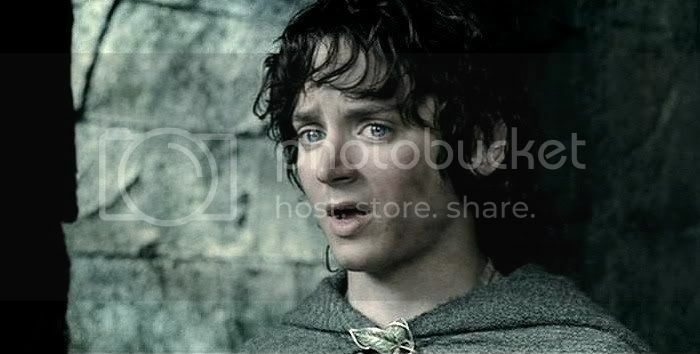 Sam becomes so at ease he ends up revealing to Faramir that what Frodo carries is the Ring. “Save me!” Sam cries, blanching then turning red. 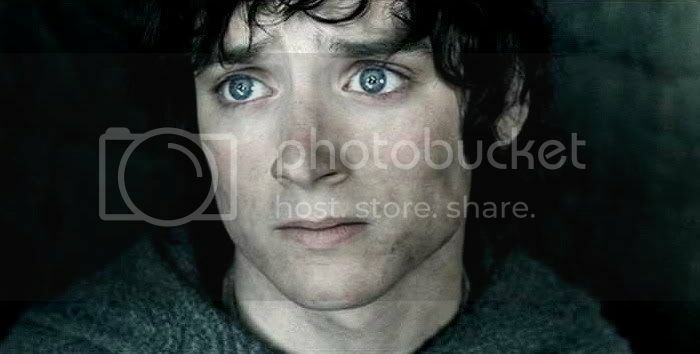 Frodo is aghast. After admonishing himself soundly, Sam appeals to the better nature of their host-captor. Slightly related book scene, from The Window on the West. ‘So it seems,’ said Faramir, slowly and very softly, with a strange smile. ‘So that is the answer to all the riddles! The One Ring that was thought to have perished from the world. And Boromir tried to take it by force? And you escaped? And ran all the way—tto me! And here in the wild I have you: two Halflings, and a host of men at my call, and the Ring of Rings. A pretty stroke of fortune! A chance for Faramir, Captain of Gondor, to show his quality! Ha!’ He stood up, very tall and stern, his grey eyes glinting. Frodo and Sam sprang from their stools and set themselves side by side with their backs to the wall, fumbling for their sword-hilts. There was a silence. Al the men in the cave stopped talking and looked towards them in wonder. But Faramir sat down again in his chair and began to laugh quietly, and then suddenly became grave again. ‘Alas for Boromir! It was too sore a trial!’ he said. ‘How you have increased my sorrow, you two strange wanderers from a far country, bearing the peril of Men! But you are less judges of Men than I of Halflings. We are truth-speakers, we men of Gondor. We boast seldom, and then perform, or die in the attempt. Not if I found it on the highway would I take it I said. Even if I were such a man as to desire this thing, and even though I knew not clearly what this things was when I spoke, still I should take those words as a vow, and be held by them. The hobbits came back to their seats and sat very quiet. Men turned back to their drink and their talk, perceiving that their captain had had some just of other with the little guests, and that it was over. I know we keep saying "stunning" and "he takes my breath away", but it's *true*, isn't it? Yes, he's wonderfully vulnerable looking in the close-ups in this scene. 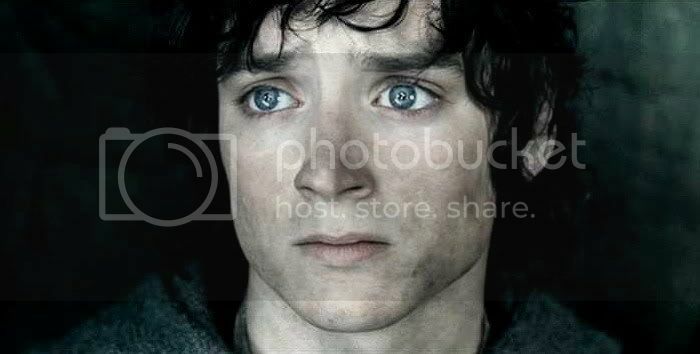 When I read the book passages that talk about how worn and older, yet beautiful Frodo looks to Sam, I think of these images. "Wisdom and sorrow." Yes, I can see that, too. Guh. Such a pretty Frodo! I happen to love that movie scene of farewell and wish it had been in the original movie. Yes, it's an excellent scene from TTT. I felt even sorrier that the scene in which Faramir sees the funeral boat and remembers him and Boromir together was not included. It was beautifully done, and went a long way to explain the portrayal of the family dynamics in the the House of the Steward. Absolutely. More sympathetic, but also more understandable in his non-book choices. Oh, guh. The only colour in these scenes seems to be the bloody flicker of Mount Doom and Frodo's lips. He's pretty guh-inducing in these, Peachy, you're right. And, yes, that bone structure is "elegant" -- clean lines, elegantly and strongly chiselled, clothed in the finest skin imaginable. 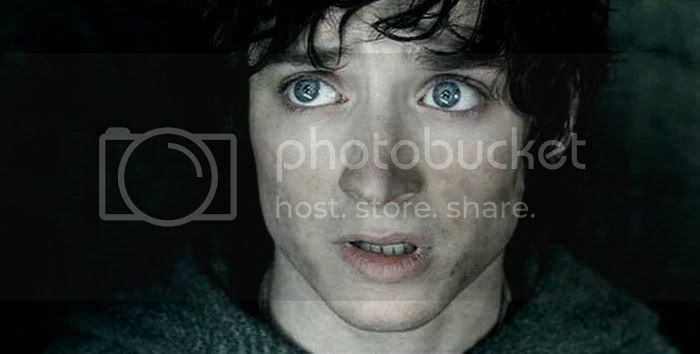 That's our film Frodo. This is an amaxing post; next time I watch TTT I'm going to remember what you've said here. Thank you, Ruby, for stopping by and posting. And happy viewing! Yes, sorry, I know it's a lot at once. I've been on a roll, White Gull. "Strike while the iron is hot" is a sound adage. My iron is usually pretty tepid, so I'm taking advantage of the impetus. 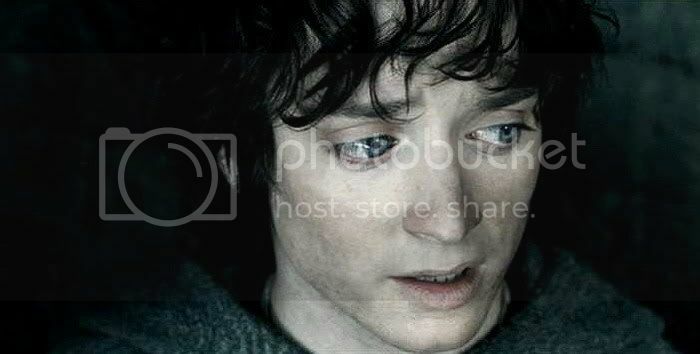 I don't often get angry with PJ, as I think he deserves far more bouquets than brickbats, but I really can't abide what he did to Frodo, Sam, Faramir and Gollum in TTT. I just don't watch those scenes, they're too aggravating. But as for Frodo versus the Nazgul on the walls of Osgiliath, visually it's absolutely incredible. I remember a poster from TORC, Akallabeth, describing it as "a dream of hell". I remember a poster from TORC, Akallabeth, describing it as "a dream of hell". I'm not familiar with the posting of Akallabeth, but what a great description! As I keep looking at those screencaps I keep thinking what a fantastic engraving or woodcut the scene would make: yes, just like a demon rising up out of Hell to try and grasp Frodo and drag him down into the fiery pit. Yeah, that silly Faramir, letting Frodo leave and get slobbered on by Shelob. 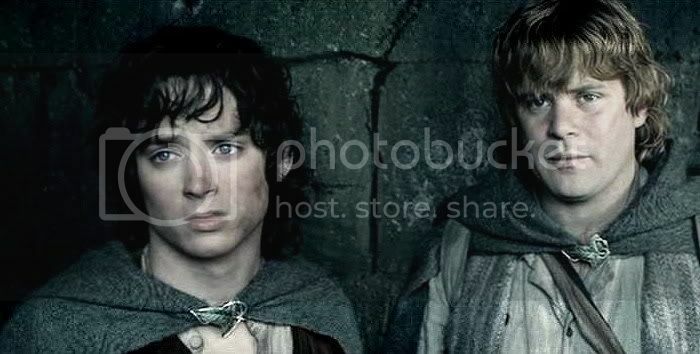 As to the Frodo-Gollum-Sam-Faramir portrayals laid down in TTT, you mustn't be so bitter, Pearl. It's an adaptation, after all. And you do like RotK (although not every minute), yet what happens for these four in that film flows directly from what is portrayed in TTT. Mechtild, thank you for continuing to spoil us with these lovely and throughtful combinations of images, essays and canon text. They surely deserve appreciation, thought and consideration from your readers. This one is no exception. I personally think the whole Osgiliath scene should have been kept out of the film, as the events there and the behaviour of Frodo and Faramir particularly (not to mention Sam's IMO horrid "UN speech") do Tolkien and and his characters many a disservice, which it proved hard to repair in the final instalment. 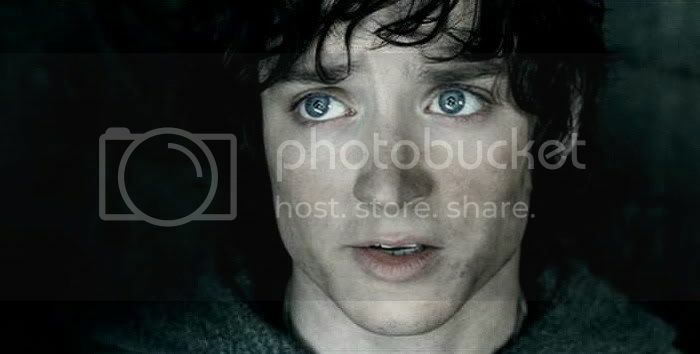 But be that as it may, the imagery is each scene is truly stunning and Frodo looks so - erm - captivatingly gorgeus in the last series it's nearly unbelievable. Have you noticed the multiple lights reflected in his eyes? He has that in some scenes (notably in the garden with Galadriel) and I like to think of it as a filmatic visual of his inner brightness making itself known and marking Frodo as a being of light. Yes, Osgiliath was an unfortunate choice (at TORc it started a whole thread about "wrong turnings" and the word, "osgiliate" to describe it--osgiliate, osgiliated, osgiliating, osgiliation, etc.). But, having made it, they did get some great mileage out of the images they made to depict it. Ah, the U.N. speech. But even that could have been better, if they were going to make that choice. I could never pay real attention to what Sam was saying there, just looking at the visuals as they epic-movied their way over the screen while he droned on. But after many viewings I finally listened to what he was saying and Sean did a really good job on it. I think it would have played better if they had stuck to showing him saying it, interspersed with reaction shots from Frodo and Gollum, as they did for a little of it. It was as if they wrote a monologue for Sean that they knew was sort of sucky, so rather than let him say it as it stands, they let the sound of his voice continue (with GREAT scoring under it from Howard), and show lots of pictures, like he was narrating a Powerpoint presentation. I know, he shouldn't have said it at all, and, as Sam said himself, "by rights, we shouldn't even be here" -- "but we are". And they were. 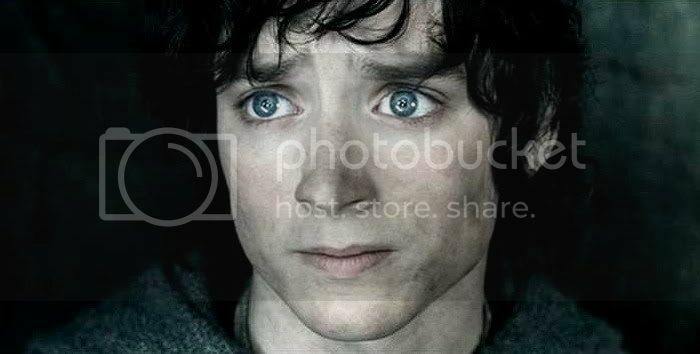 You are right about the reflections in Frodo's eyes in the sewer-scene close-ups; it's as though they are using the "Galadriel light", but with not quite as many points of light. I wonder if it was on purpose, or an accident of the lighting set-up for the scene reflecting in his eyes that way, whether they chose it or not? Maybe I'll write the lighting designed or Andrew Lesnie (he remembers great annecdotes, normally) a letter? Not. Hey, I think it'd be great if you wrote to A. Lesnie or the lightning designer. It would be very interesting to know whether they di use the "Galadriel lights" on purpose for some of Frodo's scenes, and what the thought behind that was, if so. Not only as a part of the Frodo portrayal in general; also: Why those particular scenes? Were those the scenes where the filmmakers felt Frodo's "light for eyes to see that may" shone the clearest? For this matter, as for other details in the LotR films I've imagined many a deep and deliberate thought on character and characterization to be behind it, and have analyzed and pondered. But then again listening to the director's commentary I've also more than once happpened to think that the things I've seen some deep meaning behind probably just happened to happen, by mere lucky chance, a stroke of fortune; - still even so obviously contributing to the overall exceptional quality that resulted. Yeah, Sam was too preachy in the delivery of that speech, although it started out excellently (I thought). When Sam first looks through the ruined window and says that they should'nt even be there, and, "folks had chances for turning back", were really well done. But I always want to put my finger down my throat when I hear him say, "...and the sun will shine out the clearer!" I keep thinking of the song from Annie, "The Sun Will Come Up Tomorrow", and other "inspirational showstopper" numbers from Broadway shows. That line actually comes from some other character's speech, I believe, not the Great Tales speech (that's SUPERB on the BBC radio production discs), where it doesn't stick out so badly. But I do think Sean did a fine job on it--playing it as directed. I would have liked some other sort of monologue for him, or the same monologue delivered differently--more like the way you describe--but I'm guessing Sean A. did it the way he was asked to do it (i.e. delivering the "money speech"). I've listened two times through the three volumes on the books-on-disc of LotR, Maeglian (narrated quite well by Rob Inglis), and I love to keep recognizing bits of dialogue. They crop up all over, usually in other contexts, spoken by other characters. If you ever read Brian Sibley's book on Peter Jackson as a filmmaker, you'll find that an awful lot of what became the finished film was there by "accident" - or "providence" - for they were often flying by the seat of their pants, trying to make this massive project on what actually was a shoestring, most everyone involved never having attempted anything nearly so ambitious, the worried studio heads breathing hotly down Peter's neck almost non-stop, every time they were behind or ran over. Reading the book explained a lot of the loose ends in the films, made me sigh with relief over some of the choices that were thankfully jettisoned, and marvel anew at how super the films are, considering what a massive, sprawling project it was to make. One day, if I'm still on LJ and finish up all this other stuff, I'll post some excerpts, the ones I find most funny, interesting or illuminating. I know a lot of people didn't read it; it wasn't even sold in the U.S. But I thought it was pretty fascinating. Far too much detail for some folks, and not nearly enough about LotR and its actors for most, so I'm not saying people on my f-list would love reading the whole book anyway. Thank you Mechling! Thank you for all the work you have put into this remarkable project. The scene on the wall knocks my socks off. The close-ups of Frolijah are breathtaking. It really is difficult to choose, where he is the most beautiful throughout the films. It really is difficult to choose, where he is the most beautiful throughout the films. I'm glad you liked the wall scene. No, "he shouldn't ought to be there," but he is, so we may as well enjoy him, the little angel of darkness.